Park Nevesole is one of the places in Belluno where you can go along with your kids in order to have a relaxing and recreational time. 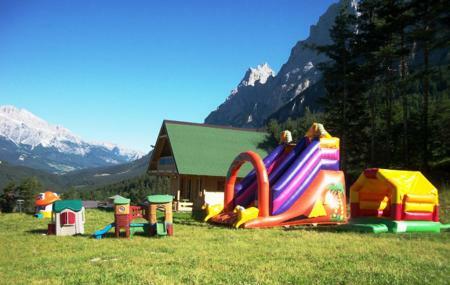 It is the perfect place where you can leave your children free to play, socialize and have fun outdoors. Located in a scenic and sunny at the foot of Mount Antelao, Nevesole Park offers its little guests and the whole family a unique fun in the snow. The field school: This area consists of a training camp with three treadmills that offer the chance to learn to ski and snowboard. The ski school is ideal for those who begin to practice this winter sport. The playground: The playground is used as a downhill on sleds and dinghies. This section also has an area dedicated to animation and Baby and Mini Club with games and inflatables. Snow covered ground. So, take extra precautions while surfing. Love this? Explore the entire list of places to visit in Belluno before you plan your trip. Fancy a good night's sleep after a tiring day? Check out where to stay in Belluno and book an accommodation of your choice. How popular is Parco Giochi Neve E Sole? People normally club together Monte Agudo and Cinque Torri while planning their visit to Parco Giochi Neve E Sole.